A veteran of more than 1000 projects, David Perry is a student of leadership and its effect on organizations ranging from private equity ventures and construction/engineering companies, to global technology corporations. With a 99.97% success rate, he has closed 1000+ projects and personally negotiated in excess of $250M in salaries. His creative recruiting principles led to him being nicknamed the ‘Rogue Recruiter’ by The Wall Street Journal. David has built an extensive personal network of leading CEOs as well as up-and-coming future executives, permitting him to find the most qualified candidates to grow a company and increase shareholder value. Perry-Martel’s Knowledge-Value™ methodology which David designed, allows clients to rapidly assess critical human qualities, track record and leadership experience. David is frequently quoted on trends and issues regarding executive search, recruiting and HR in leading business publications including The Wall Street Journal, New York Times, Fortune, Forbes, WIRED, and appears occasionally as an executive search and labor market analyst for CTV Television and CBC News World. 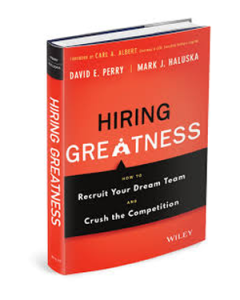 Mark Haluska is an international Executive Search Professional (aka Head Hunter or Executive Recruiter) and an Executive Job Search Coach helping people on a national and international basis land their next dream job. Mark founded and is the Executive Director of Real Time NetWork, an international boutique Executive Search Firm representing organizations ranging from small closely-held companies to well-known Fortune 100 corporations. Mark is one of only four “Certified Guerrilla Job Search Coaches”​ and the only “Senior”​ Certified Guerrilla Job Search Coach for North America. As a part of Guerrilla Job Search International, he helps people get jobs FASTER!